One Thousand and One Arabian Nights – Muslim Museum UK – Uncover the 1400 year relationship between Britain and Islam. Explore the history and heritage of Muslims in Britain. In 1948, a scholar, Nabia Abbott, discovered a fragment of manuscript dating back to the 9th century, which bears the title ‘Kitab Hadith Alf Layla’ (The Book of the Tale of the Thousand Nights). In the first few lines a character Dinazad asks Shirazad (Scheherazade) to tell him stories. Ibn al-Nadim (c937-c998) was a Muslim bookseller, calligrapher and bibliographer, in Baghdad. In 988, he compiled a book, the ‘Kitāb al-Fihrist’, also known just as, the Fihrist (the Index / Catalogue). It was ‘an index of the books of all nations, Arabs and non-Arabs alike, which were in existence in the Arabic language and script’. His book, gives testimony to the knowledge of pre-Islamic Syriac, Greek, Sanskrit, Latin and Persian in the Islamic Golden Age. In the Fihrist, Ibn al-Nadim noted that the Sassanid kings of Iran enjoyed “evening tales and fables”. He then writes about the Persian ‘Hazar Afsan’, meaning ‘The Thousand Stories’. The tales vary widely: they include historical tales, love stories, tragedies, comedies, poems, burlesques and various forms of erotica. Numerous stories depict jinns, ghouls, sorcerers, magicians, and legendary places, which are often intermingled with real people and geography. Common characters include the historical Abbasid caliph Harun al-Rashid, his Grand Vizier, Jafar al-Barmaki, and his alleged court poet Abu Nuwas. One Thousand and One Nights or Arabian Nights (‘The Nights’) was collected over many centuries by various authors, translators, and scholars across West, Central, South Asia and North Africa. The tales themselves trace their roots back to ancient and medieval Arabic, Persian, Indian, Egyptian and Mesopotamian folklore and literature compiled in Arabic during the Islamic Golden Age. 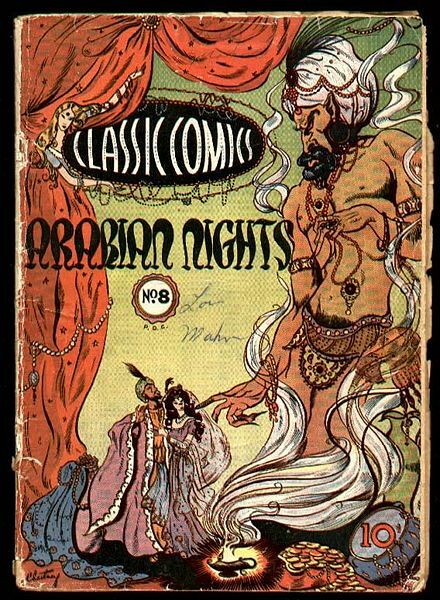 Some of the stories of ‘The Nights’, particularly ‘Aladdin’s Wonderful Lamp’, ‘Ali Baba and the Forty Thieves’ and ‘The Seven Voyages of Sinbad the Sailor’, while almost certainly genuine Middle Eastern folk tales, were not part of ‘The Nights’ tales in Arabic versions, but were added into the collection by Antoine Galland through his translation from Arabic into French in 1704. In 1706, an anonymously translated version in English appeared in Europe, entitled ‘The Arabian Nights’ Entertainment’. In 1814, the earliest existing Arabic printed version, is published by the British East India Company. A second volume was released in 1818. In 1842, four volumes were published with extra tales. These are known as Calcutta I and Calcutta II, respectively. In 1840, Edward William Lane (1801-1876), a British Orientalist, publishes an English translation, which he censored, with the usual 19th century view on ‘Victorian morality’. In 1884, John Payne (1842-1916), an English poet and translator, publishes an English version translated entirely from Calcutta II, adding some tales from Calcutta I and elsewhere. In 1888, Sir Richard Francis Burton (1821-1890), an English geographer, explorer, translator, writer, soldier, Orientalist, cartographer, ethnologist, spy, linguist, poet, fencer and diplomat, publishes an English translation from several sources. His version however, accentuated the sexuality of the stories. Many others have been produced since. The tales use a variety of settings, including Baghdad, Basra, Cairo and Damascus, as well as China, Greece, India, North Africa and Turkey. The influence of ‘The Nights’ on world literature is immense. They have been translated into many languages and through time have penetrated the folklore of many countries worldwide. For example, ‘The Ruined Man who Became Rich Again through a Dream’ a story of self-fulfilling prophecy, later appears to have entered English folklore as the “Pedlar of Swaffham” and similar to that of Paulo Coelho’s ‘The Alchemist’. Several stories within ‘The Nights’ feature early science fiction elements, one example is ‘The Adventures of Bulukiya’, where the main character quests for the herb of immortality leading him to travel across the cosmos to different worlds much larger than his own world, along the way, he encounters societies of jinns, mermaids, talking serpents, talking trees, and other forms of life. Other tales depict Amazon societies dominated by women, lost ancient technologies, advanced ancient civilisations that went astray, and catastrophes which overwhelmed them. “The City of Brass” features a group of travellers on an archaeological expedition across the Sahara to find an ancient lost city and attempt to recover a brass vessel that Solomon once used to trap a jinn, and, along the way, encounter a mummified queen, petrified inhabitants, lifelike humanoid robots, and a brass horseman robot. “The Ebony Horse” features a flying mechanical horse controlled using keys that could fly into outer space. 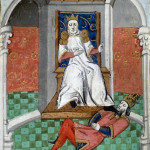 This story appears to have influenced later European tales such as ‘The Squire’s Prologue and Tale’ told in Geoffrey Chaucer’s The Canterbury Tales. In the frame (main) story a young lady, tells tales every night and ends them at an intriguing moment so as to keep her captor wanting to hear the end of the story the next day. The tale would then turn into another story, and then another, thus saving her life for 1001 nights. A similar storyline can be seen in Stephen King’s Misery, in which an author is forced to write a novel to keep his captor from torturing and killing him. Many writers have been influenced by ‘The Nights’ including Henry Fielding (1707-1754), the English novelist and dramatist; Naguib Mahfouz (1911-2006) the Egyptian writer who won the 1988 Nobel Prize for Literature; Walter Scott (1771-1832) the Scottish historical novelist, playwright, and poet; William Makepeace Thackeray (1811-1863) the English novelist; Wilkie Collins (1824-1889) the English novelist, playwright, and author of short stories; Elizabeth Gaskell (1810-1865) the British novelist and short story writer; Charles Nodier (1780-1844) the French author who introduced a younger generation of Romanticists to the ‘conte fantastique’, gothic literature, vampire tales; Gustave Flaubert (1821-1880) the influential French writer widely considered one of the greatest novelists in Western literature; Stendhal (1783-1842) the French writer, considered one of the earliest and foremost practitioners of realism; Alexandre Dumas 1802-1870) one of the most widely read French authors in history, he is best known for his historical novels of high adventure, including The Three Musketeers. His novels have been adapted for nearly 200 films; Gérard de Nerval (1808-1855) one of the most essentially Romantic French poets; Alexander Pushkin (1799-1837) considered by many to be the greatest Russian poet and the founder of modern Russian literature; Leo Tolstoy (1828-1910) the master of realistic fiction, best known for War and Peace; Conan Doyle (1859-1930) the Scottish physician and writer, best known for Sherlock Holmes; W. B. Yeats (1865-1939) a pillar of both the Irish and British literary establishments; H. G. Wells (1866-1946) the English writer, best known for The War of the Worlds, The Time Machine, The Invisible Man and The Island of Doctor Moreau; H. P. Lovecraft (1890-1937) one of the most significant 20th century authors in horror fiction; A. S. Byatt (b.1936) the English novelist, poet and Booker Prize winner; Angela Carter (1940-1992) the English novelist and journalist, known for her feminist, magical realism, and picaresque works. William Wordsworth (1770-1850) Britain’s Poet Laureate from 1843 until his death in 1850; Alfred Tennyson (1809-1892) the Poet Laureate of Great Britain and Ireland during much of Queen Victoria’s reign, remaining one of the most popular British poets; both wrote about their childhood reading of the tales. Charles Dickens (1812-1870) generally regarded as the greatest novelist of the Victorian period was another enthusiast and the atmosphere of ‘The Nights’ pervades the opening of his last novel The Mystery of Edwin Drood. The atmosphere of ‘The Nights’ have influenced such films the 1924 Hollywood film The Thief of Baghdad, and its 1940 British remake. Several stories served as source material for The Adventures of Prince Achmed (1926), the oldest surviving feature-length animated film. In the late 1930s, Fleischer Studios made three two-reel animated Popeye cartoons in colour for Paramount Pictures. All three cartoons were adapted from ‘The Nights’: Popeye the Sailor Meets Sindbad the Sailor, Popeye the Sailor Meets Ali Baba’s Forty Thieves, and Aladdin and His Wonderful Lamp. In 1942, Hollywood releases a movie called Arabian Nights. In 1944, Ali Baba and the Forty Thieves is released. In 1952, a Universal Pictures movie, The Golden Blade, Harun al-Rashid uses a magical sword that makes him invincible to free Baghdad from the evil vizier Jafar. In 1958, The 7th Voyage of Sinbad movie was produced by the stop-motion animation pioneer Ray Harryhausen. Harryhausen also provided the stop-motion effects for The Golden Voyage of Sinbad (1974) and Sinbad and the Eye of the Tiger (1977). In 1959 UPA released an animated feature starring Mr. Magoo, entitled 1001 Arabian Nights. The most commercially successful movie based on The Nights was Aladdin, the 1992 animated movie by the Walt Disney Company, which starred the voices of Scott Weinger and Robin Williams. 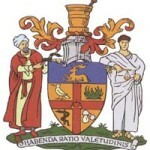 Scheherazade and her “thousand tales” are referred to in one of the songs from the film. “The Voyages of Sinbad” has been adapted for television and film several times, most recently in the 2003 animated feature Sinbad: Legend of the Seven Seas, featuring the voices of Brad Pitt and Catherine Zeta-Jones. There are also numerous Bollywood movies inspired by the book, including Aladdin and Sinbad. In this version the two heroes meet and share in each other’s adventures; the jinn of the lamp is female, and Aladdin marries her rather than the princess. In the episode ‘Stan of Arabia (Part II)’ of American Dad!, Roger distracts a wealthy sheik with stories from American soap operas to delay consummating their marriage. Bugs Bunny portrayed a Scheherazade-like character in Bugs Bunny’s 3rd Movie: 1001 Rabbit Tales. Bugs must entertain Sultan Yosemite Sam and his son Prince Abba-Dabba with story after story or else be subject to beheading.